When you're visiting Scotland, where do you go? Edinburgh’s Royal Mile, Glencoe, Skye? Where you are not likely to go is the northern shore of Fife. Even the Fife Coastal Path started at the Tay Bridge, missing out the entire North Fife shore. (Only in the last couple of years has the path been extended to Newburgh.) North Fife is one of those areas that nobody visits, a blank on the map like the coal villages of eastern Lanarkshire. It is terra incognita. I don’t know about you, but I find that irresistible. I was attracted to Newburgh by the density of casually scattered historical remains, like stones in a Lochaber field or churches in Rome. There are so many remains that Clatchard Craig was quarried for aggregate. No big deal, Clatchard’s just an ancient hillfort, plenty more where they came from. To the south Denmylne Castle, to the south-west Macduff’s Cross, to the west, Abernethy round tower. At some point this must have been an important place, but the tide of history has receded, leaving Newburgh alone with its memories. I had read about it on the internet. 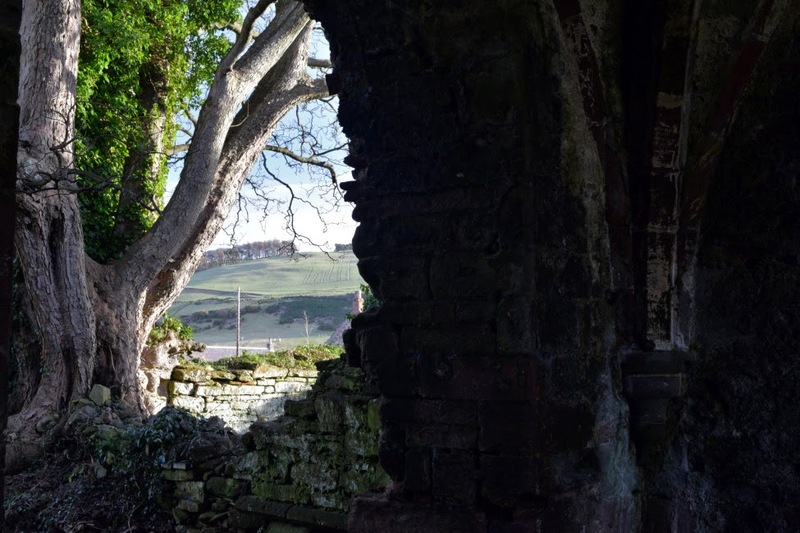 The abbey was founded around 1180 and is the place where whisky production was first documented, in 1494. I hadn't expected it to be quite so ruined - or have rockery plants! (It really is someone’s garden.) 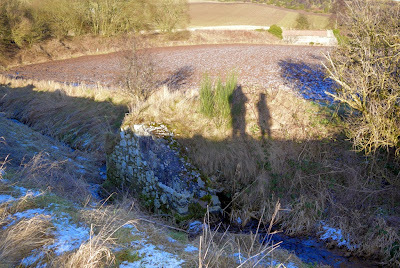 The other strange feature above Lindores is a large figure gouged out of the hillside. What could it be? We asked a passer-by. She was a mine of information. The figure on the hillside was a bear and a post - the symbol of Warwick - due to some ancient connection between the English Midlands town and one of the king Alexanders. The hillside figure itself is only twenty-odd years old though. She was also full of questions. Where were we from? What brought us to Newburgh? It was a lovely community in her opinion, like a time capsule from the 1950s. Young people like us bought dilapidated Georgian houses in the town and did them up. We heard about the eel house, used by monks from the abbey to catch eels. I had an urge to find the eel house. First we headed down to the waterfront. This was surprisingly attractive, with little piers and boats. 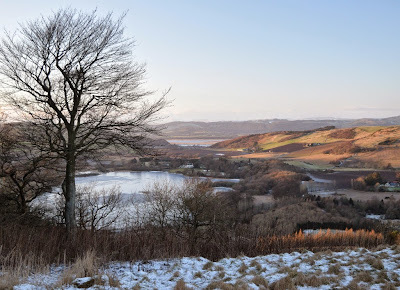 The Tay is broad here and quite wild, reed-fringed with an island mid channel and the distant Highlands gleaming white in snow. This used to be the site of a giant linoleum factory until the 1970s. Another piece of local history, all trace gone. Behind, Newburgh straggled steeply up its hill, most of the town in its shadow. I think this is one reason North Fife is neglected by outsiders. Who wants to hang around and overshadowed town? 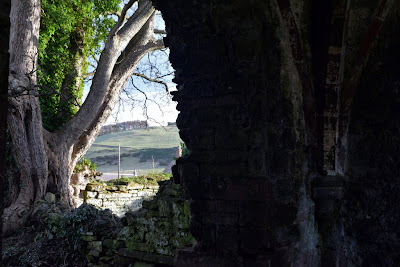 The eel house, we had been told, was on the outflow of the burn that ran from Lindores Loch to the sea, a mile or so from the abbey and not far from the loch. We parked at Abdie and Dunbog church (an interesting ruined predecessor is a quarter mile distant) and looked up and down the stream. And there we found it! It is still intact and functional. 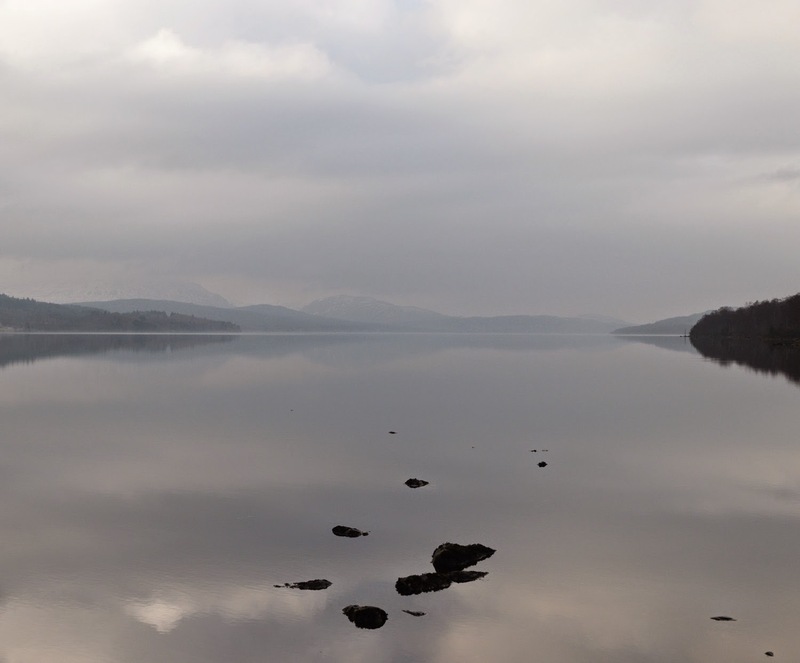 It was built by medieval monks to catch eels as they migrated between the loch and the sea. What a lovely, random thing to find. This was the highlight of my day, but there was one last curio. A Marilyn, Cairney Hill, quickly bagged before sunset, the low hills of Fife rolling in every direction and pheasant tracks in the snow. On the top an amateur radio enthusiast who told us about his hobby. It had been a lovely day meeting some interesting people. Newburgh, intact in itself, receiving - and needing - no external interest. 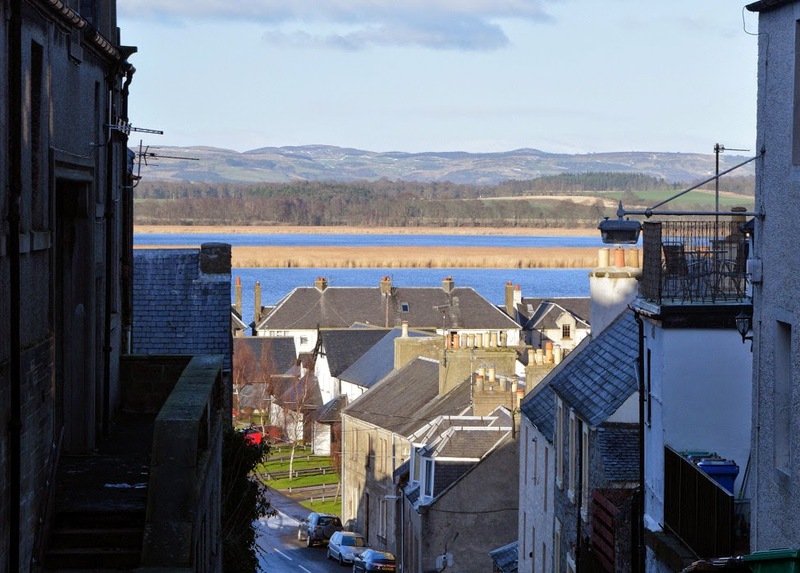 Rather than being an area of no interest, this part of North Fife is Ecosse profonde. 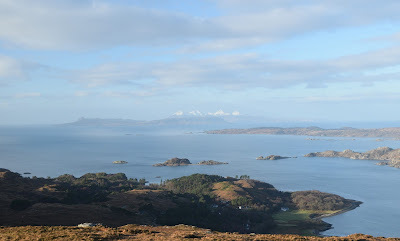 Summer is the normal season for an expedition to Arran. 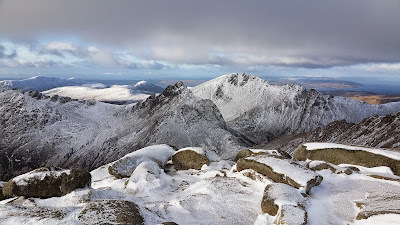 In winter Arran becomes remote - a blind spot in the imagination, despite its proximity to the Central Belt. Bloody Caledonian Macbrayne! The boat was still in port, but I couldn't alight. A 200 mile round trip for nothing. A beautiful day wasted. I was distraught. I drove home doing my best to count my many blessings, listening to Andy Murray screw up his day as well as I had mine. Next time, Arran. Next time.